Cornwall is not only a great place for families, couples and independent travellers but also for our four-legged friends. 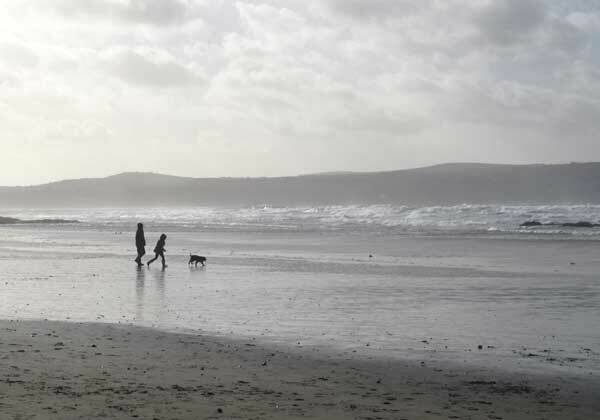 Why leave your dog at home when Cornwall is the ideal place to enjoy with your family pet. Cornwall welcomes dogs with its miles and miles of glorious sandy beaches, scenic coves with rock pools, hundreds of miles of public footpaths and fascinating trails, rugged moorland, acres of woodland and not forgetting the Cornwall Coast Path. If you're going cycling along any of Cornwall's multi-use trails such as the beautiful Camel Trail, your dog can go with you, even if he's getting on a bit and not so good on his legs anymore. Dog buggies can be hired to tow behind your bicycle. All types of accommodation throughout Cornwall welcome dogs as do many pubs and restaurants. 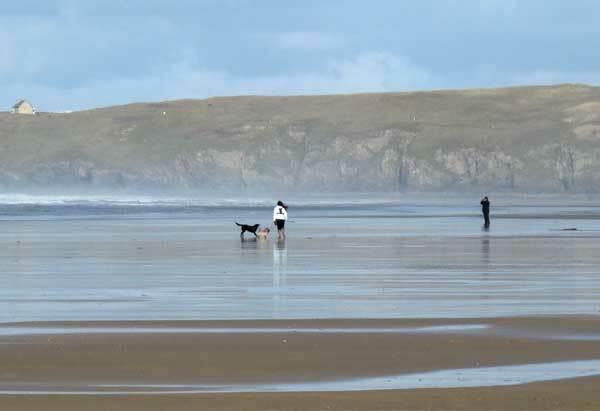 Of Cornwall's hundreds of beaches at least 159 welcome dogs all year round, 47 have seasonal restrictions between Easter and the 1st of October and only 7 beaches do not allow dogs at any time of the year. Of the seasonal restrictions, 32 only restrict dogs between 7am - 7pm or 8am - 7pm so there are plenty of beaches for you and your dog to enjoy whatever time of year you choose to visit. 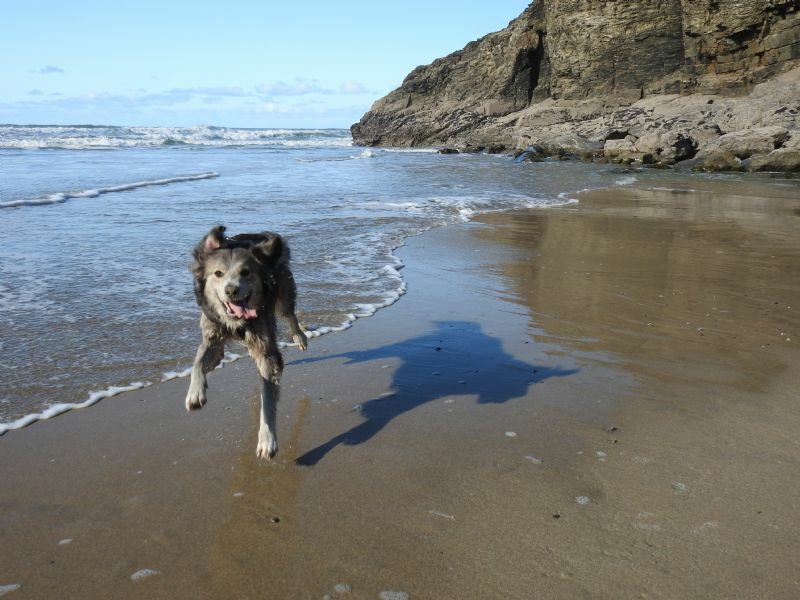 As dog owners ourselves we know how much our own dog loves being in Cornwall: meeting up with doggy friends while playing ball on the beach, enjoying a splash while bounding through the waves and experiencing the new smells of the countryside on coastal foot paths and moorland walks. During the summer months many towns and villages in Cornwall hold country fairs and village fetes with dog shows awarding everything from fun, waggiest tail to more formal, pedigree events. Cornwall even holds its own dog festival, where your dog can invite you along to enjoy the day (dog and owner entertainments on the day). How to use this website to find dog friendly places to stay, dog friendly beaches, dog friendly pubs and dog friendly attractions and places to visit. Wondering where you can take your dog in Cornwall? 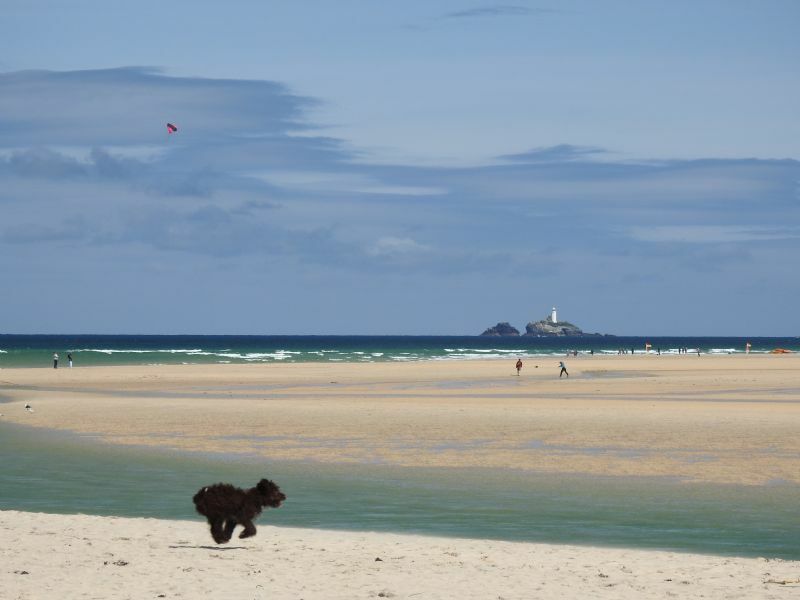 See the information below for details of beaches, our map of dog friendly beaches and seasonally restricted beaches and other dog friendly locations in Cornwall to help you plan your holiday. Visit our featured dog friendly accommodation. 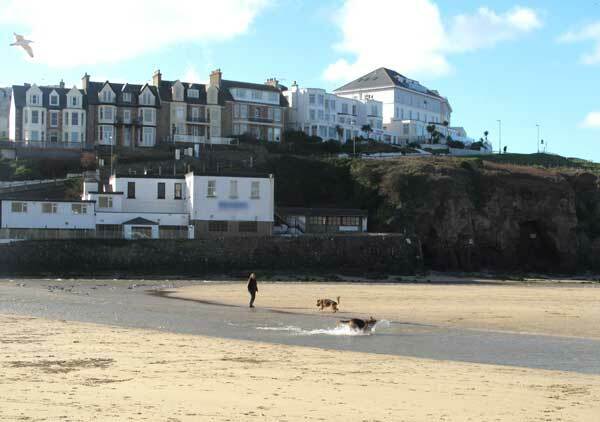 For more dog friendly places in Cornwall see the list at the bottom of this page. You can also use the 'Search intoCornwall.com' tool on the top of all our pages to search for dog friendly accommodation and locations. Just enter dog friendly in the box and click Search. Visiting an attraction where you can't take your dog or going out for the day/evening and don't want to leave your dog home alone? View Dog Sitters in Cornwall. where dogs are allowed all year round. 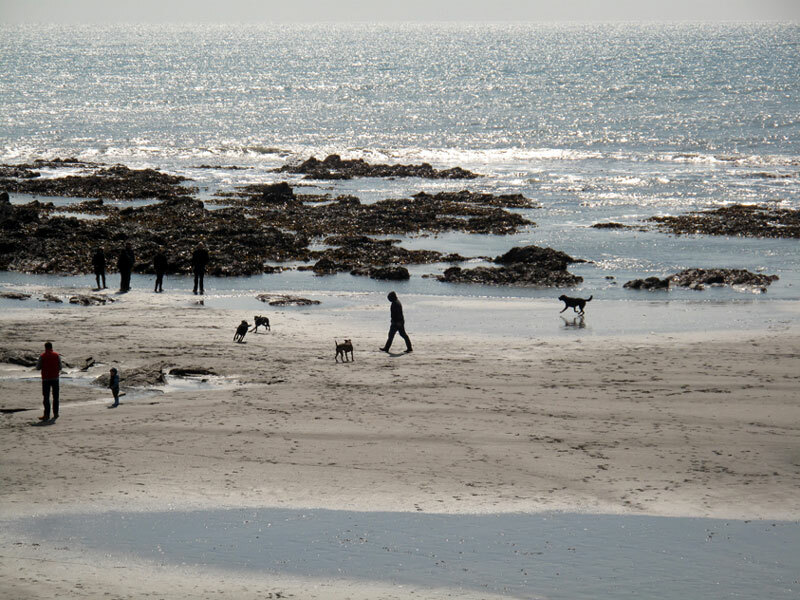 40 Coverack Dogs must be kept on a lead between 1st June until the end of August between 9am and 6pm. 54 Polnare Cove Dogs allowed all year round. Check with your accommodation to make sure you know their policy on accepting pets. Think about what you'll do with your dog whilst visiting restaurants or attractions that do not accept dogs. If you're travelling by public transport check the travel company's policy on carrying dogs. Trains in the UK will allow two dogs per passenger at no extra charge provided the dogs are kept on a lead or in a basket and they do not cause inconvenience to other passengers or staff. A charge will be made for per extra dog if the allowance is exceeded. Buses and trains in Cornwall do allow dogs. Coaches to Cornwall do not allow dogs except for guide dogs, hearing dogs or assistance dogs. Never leave your dog unattended in a vehicle, even for a short time, when it's warm or hot outside. Dogs left in warm cars will suffer from heat exhaustion and could die. If you have to leave your dog alone in your car at any other time, leave a note stating when you will be returning to your vehicle and do return on time. This will avoid concerned members of the public from contacting the RSPCA or Police to free the dog. You must book your return journey in advance with a PETS-approved sea, air or rail route. Most major ferry companies, airlines and rail operators are approved. If your dog is elderly or frail it will be better to exercise them during cooler times of the day such as early morning or late evening to avoid over exerting them in hot weather. The law requires that all dogs wear a collar and tag with the name and address of their owner. You may find it useful to place a temporary tag on your dog with the address of your holiday accommodation. If your dog goes missing in Cornwall please contact the Cornwall Dog Welfare Service on the number below. Be responsible and keep your dog under control. Depending on the circumstances or the location short leads, extending leads or even off lead may be appropriate. Remember, you may know your dog is friendly and just likes to greet people but a family on the beach with small children may find the sight of your Great Dane bounding towards them somewhat daunting. 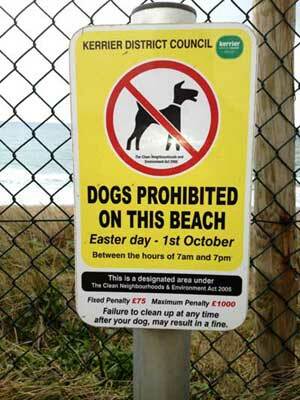 Some beaches have a partial dog ban at certain times of the year. Look out for these signs. 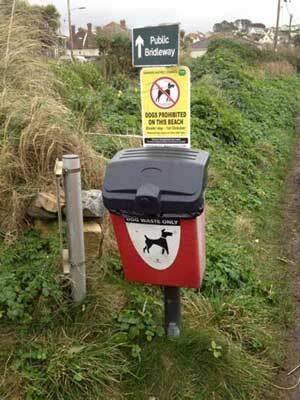 Place your bagged dog waste in the red dog bin. Dog bins are usually located adjacent to the beach or walking areas.